Rosahl is a solid-state micro dehumidifier designed to protect sensitive electronic and electro-optic devices from moisture damage. It uses a unique solid polymer electrolyte (SPE) to remove moisture from enclosures from 250ml up to 4³. Rosahl is a unique dehumidifier that utilises a solid state polymer ionic membrane to remove moisture from the air by electrolysis when a 3V dc voltage is applied. 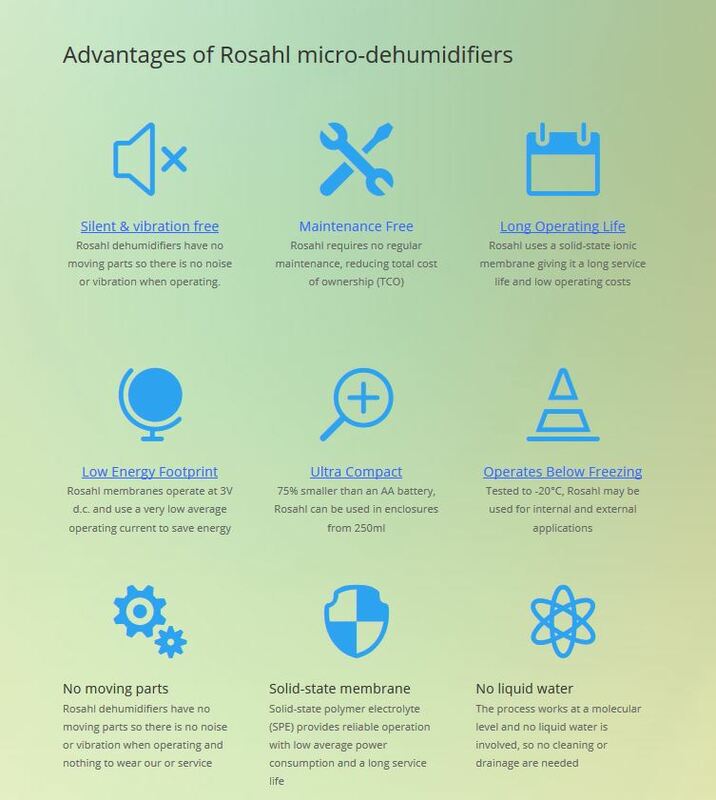 There are no moving parts so Rosahl dehumidifiers are silent and vibration free. Operation is maintenance free and the devices have a low running cost. When a voltage is applied to the porous electrode attached to the SPE the moisture on the anode side (dehumidifying side) dissociates into hydrogen ions (H+) and oxygen: the hydrogen ions migrate through the membrane to be discharged on the cathode (moisture discharging) side where they react with oxygen in the air, resulting in water vapour being discharged. Similarly, if the membrane is reversed a humidifying effect is achieved. The dehumidifying SPE membrane is mounted in a plastic case which is normally installed in the side of the enclosure used to protect sensitive devices is to be dehumidified. Several versions are available: the flat membrane dehumidifiers are suitable for drying up to two litres and measure 24 x 30 x 5.5mm. They can be mounted inside or outside the enclosure. A similar capacity version is available in an M12 fitting. Rosahl membranes can also be used to humidify an enclosure, and by using two membranes, they will hold a balanced humidity level when fitted with the appropriate controls.